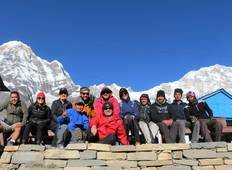 Find the right tour for you through Machhapuchhare. 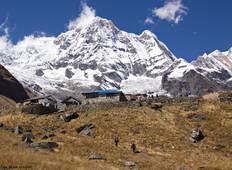 We've got 28 tours going to Machhapuchhare, starting from just 7 days in length, and the longest tour is 89 days. The most popular month to go is May, which has the most number of tour departures. "I can definitively recommend the agency Unique Adventure. Khum (owner) is really..."
"Chris (and your company) is a great guide and with a lot of experience, I did several..."
"The top view of mountains"
"Excellent tour arrangements from start to finish. The guides and porters were exceptional...."
"“This was a very well planned holiday..Our guide, Mr Bimal did a great job keeping..."
"Traveled in a group of 18 from Malaysia for 12 days Annapurna Base Camp expedition...."
"Between our porter and guide we had all the knowledge and guidance we needed. We..."
"Good Trip, would recommend anyone." "The weather, the mountains and villages and culture"